Picking Bones from Ash [Book Review] – my books. my life. 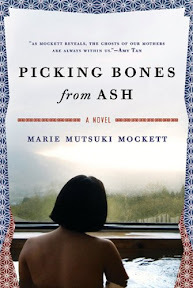 Spanning four decades, and three continents, Picking Bones from Ash tells the story of Satomi and her daughter Rumi. Satomi, a talented pianist, lives with her mother in northern Japan. When her mother remarries and Satomi gains two stepsisters, she feels betrayed. Thirty years later, Rumi lives a sheltered life in San Francisco working as an art dealer with her father, but the ghosts of her past call her to visit her mother’s homeland. (This is a very hard book to describe and the back cover wasn’t helpful either). I loved this book. I want to thank Jen from Devourer of Books and Nicole from Linus’ Blanket for the opportunity to read this for their BOOK CLUB. I’m not sure it would have grabbed my attention otherwise. The narration alternates between Satomi and Rumi. Both narrators struggle to find their place in the world and their family. The first section with Satomi is definitely my favorite and I think it is the most developed. Things happen to Satomi’s character later in the book that changed my feelings toward her (and are just strange), but this first section of her growing up in northern Japan and then studying to become a concert pianist is a wonderful coming of age story. Rumi’s story is shorter but she gets more of the “present.” . Mockett’s writing is gorgeous. She has a beautiful talent for descriptive language. I felt like I was in Japan watching the events unfold. I, the constantly-distracted-by-shiny-objects reader, was completely absorbed in this story. I just wanted to keep reading and was reluctant when life made me put it down. There are ghosts in this story and I know that alone will turn some people off. But the supernatural aspect is so subtle that I hope it doesn’t. Picking Bones from Ash simply embraces the Japanese culture and the ghosts that come with it. They are on the fringes but they are not the story. I highly recommend Picking Bones from Ash. In light of the recent disaster, and although it does nothing constructive to help, it felt fitting to read a book set in Japan. If you are looking for a complicated family-story, a story of mothers and daughters, a story of the way outside events shape our lives, please pick up Picking Bones from Ash. Intersting review. I have to admit I’m not so very keen on stories with a supernatural aspect, but you’ve made me curious about this book. I think I’ll give it a go. I have read other reviews of this book that validate your thoughts about the characters being hard to get close to, but still think this sounds like a really interesting book. I love the review you wrote, and think the fact that it contains ghosts actually enhances my desire to read this. Thanks for sharing your perceptive thoughts on this book with us! It would make sense if the characters are restrained because that is so much a part of the culture. And ghosts don’t bother me (being a long-time fan of Stephen King). I’ve actually had a rash of ghosts in my recent books and I’ve thoroughly enjoyed them. This sounds like an excellent book club selection!